The general set up of BlogWall requires a high-end computer with a good graphics card, projector and a screen. Dedicated GSM/GPRS modem is used to receive SMS messages. The user stands in front of the projector screen and sends a SMS to a given number. The application issues AT commands to the modem to locate SMS. All the messages received by the server will be written to a log file along with originator phone number and the date/time. The application consists of several modes of operation. Based on the enabled modes it offers different services to the user. If the application is in the standard display mode, it will immediately display the text message in an animated way. 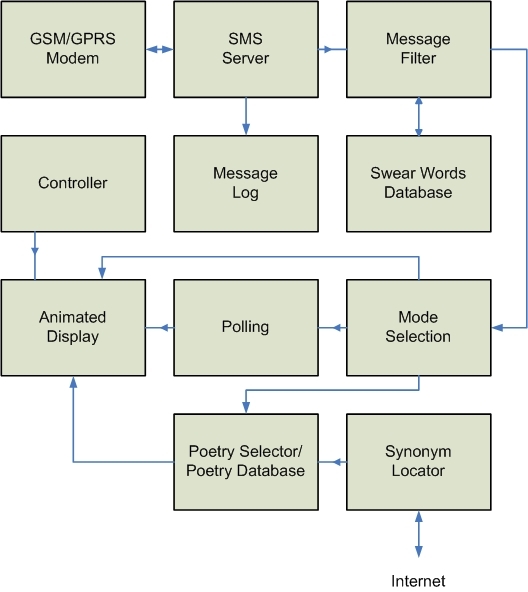 When the system receives the SMS it selects a random animation for the SMS as shown in Figure 3. 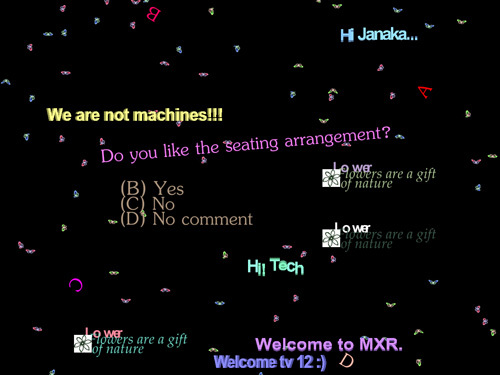 The system shows several animations in the background such as flying butterflies. The polling function is used to collect user opinions. The system displays polling question and available answers. The answers are indexed by single alphabetical letter with in parenthesis. To select an option user SMS appropriate letter to the system. System also has the capability to provide statistical data to system administrators. Keyword triggering mode enables the application to trigger an internal function based on a word in the SMS. This feature is somewhat similar to the features found in popular chat programs like Windows Messenger. For example if the SMS contains word “love" the application may replace the word “love” with an image of a heart. The keyword triggering mode also can display a small verse based on the words found in the SMS. The images as well as verses are selected from an internal database. The most prominent feature of the application is its ability to create poetry. In the poetry mode users SMS is analyzed to identify most prominent words. Those words are posted to a free dictionary website. The website will generate the synonyms related to the posted words and the system finds them by analyzing the HTML response of the website. The synonyms are used to rank poems and poetry lines in an internal database. The database consists of lines of poetry and keywords related to each line and poem. When the system administrator adds a new poem to the system all the keywords related to the poem and poem lines get generated and stored in separate table in the database. The ranking of the poems is done based on the number of synonyms found in each poem. The poem that contains most number of synonyms gets the highest poem ranking. In the selected poem, the line that contains the highest number of synonyms gets the highest line ranking. Based on ranking most suitable poetry line will be selected to display. This unique ranking system enables the system to borrow lines of poetry from different poets. Therefore the finial outcome of the system is unusual as well as surprising. The system displays the original SMS, English meaning of the poem and the original language poetry on the display screen. Through the generation of poetry, we aim to create another step in the promotion of cultural computing.